Blank brass pentagonal metal tags. Blank brass triangular metal tags. Metal nameplates and metal tags. Part of our blank brass tag range. Circular shape, available in three sizes. 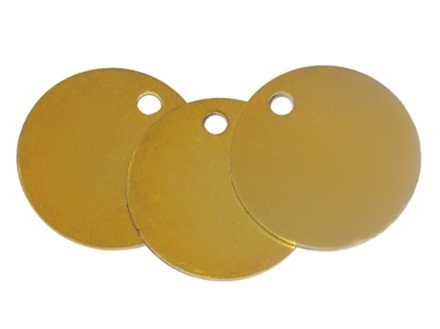 Blank metal tags, brass. 18swg (1mm thickness), with 1 fixing hole (4.2mm diameter). 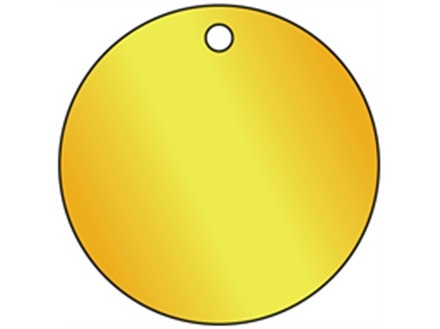 Suitable for engraving, stamping or marking. Abrasion and chemical resistant. Supplied in packs of 25 tags. TBB0 Size 25mm diameter. Material brass. TBB1 Size 38mm diameter. Material brass. TBB2 Size 50mm diameter. Material brass.